Mounted in various locations around Nathan Phillips Square and City Hall (from Council Chambers to the underground parking garage), Museum for the End of the World is an exercise in creativity and crisis. It was part of Toronto’s Nuit Blanche 2012. One of the greater ironies of human existence is the persistent anticipation of its end. Whether the result of monster waves, unstoppable pandemics, nuclear calamities or the sun ceasing to shine, the idea of Doomsday – that revelatory moment of the end of the world – can be at once the fire of speculative lamentation and the spark of insightful creativity. Indeed, the link between creativity and the apocalypse has a long history, from Noah’s shipbuilding and organizational skills to the literal bean counters buried deep beneath the mountains of Norway, stockpiling all the seeds of globe for the post-apocalyptic garden. In this way, the very idea of the Wunderkammen, with its princely mission of amassing, cataloguing and displaying was fueled by a fear of the end of the world. 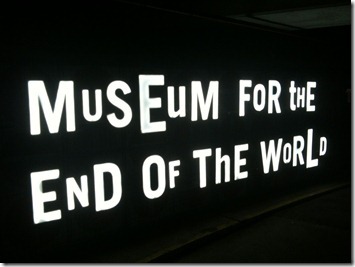 Museum for the End of the World at Scotiabank Nuit Blanche 2012 is a provocative, critical rumination about end times and a world in transition. Artists: Douglas Coupland, Thomas Blanchard, Iris Häussler, Jean Michel Crettaz and Mark-David Hosale, Dana Claxton, Sarah Beck, Geoffrey Pugen, Joshua Bonnetta, An Te Liu, Tania Mouraud, Christine Davis, The Nathaniel Dett Chorale, Marco Brambilla and featuring ‘Until the End of the World’ – a symposium delivered by Arthur Kroker, Brenda Longfellow and Slavoj Žižek.